I believe in the things that were done, and there are evidences of many things done on Mars. There are streets and houses, and there are books, I imagine, and big canals and clocks and places for stabling …. Everywhere I look I see things that were used. They were touched and handled for centuries. Ask me, then, if I believe in the spirit of the things as they were used, and I’ll say yes. They’re all here. All the things which had uses. All the mountains which had names. And we’ll never be able to use them without feeling uncomfortable. And somehow the mountains will never sound right to us; we’ll give them new names, but the old names are there, somewhere in time …. No matter how we touch Mars, we’ll never touch it. And then we’ll get mad at it, and you know what we’ll do? We’ll rip it up, rip the skin off, and change it to fit ourselves. Until now my only exposure to Ray Bradbury’s The Martian Chronicles is very hazy memories of the tv series featuring Rock Hudson some 30 years ago. I doubt if this version would stand up to the test of time, although I remember the premise of the astronauts visiting the dead planet Mars being a rather haunting one. What I’ll call the Hudson episode is one of countless memorable scenes in the book, which amounts to a set of extremely effective and mostly chilling short stories set in the period 1999 to 2026 (The Martian Chronicles was written in 1950). Bradbury explores the impact upon Humanity in attempting, and largely failing, to colonise a seemingly inhabitable but ultimately very alien world. The technicalities of science fiction don’t really interest him; the colonists travel by rocket and he goes no further in explaining the mechanics of their interplanetary movements. 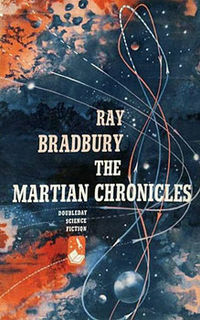 And although it’s more than likely that the prospect of Mars being able to sustain human or any type of life was well known at the time, Bradbury is more concerned with the romance and intrigue of space exploration; Mars merely serves as the setting for his wonderful interlinked stories. He’s said himself that The Martian Chronicles is much more of a fantasy novel than science fiction. The Martian Chronicles begins with accounts of the first few exploratory space missions to Mars, mostly resulting in the disappearance and death of the early settlers at the hands of the distrustful Martians. One rocket crew are locked in an asylum and then later “mercifully” euthanised to rid them of their delusions about being from the planet Earth. Another band of settlers are fooled by the telepathic Martians into thinking that their family and friends are there to greet them. A further mission to the Red Planet (the Hudson episode) finds it deserted; Martians apparently wiped out by Chicken Pox; the episode results in a crew member going insane and killing his fellow travellers. The apparently deserted world weighed down by the history of the Martians sets the premise for most of the book’s remainder; with settlers driven mad by the ghosts – real or imagined – of the dead fathers of the planet. Abandoned cities, long empty highways and very lonely settlers abandoned by a nuclear war on Earth make a brilliantly written, almost poetic, meditation on Man’s ambition to wander the skies. And how he might be doomed. Neil Gaiman’s debt to Ray Bradbury as master of the macabre short story made me want to go back and reread a couple of classics. Bradbury’s world always appears to be on the periphery of what’s comfortable and safe, occupying antiquated fairgrounds and remote shacks on the edges of windswept landscapes. His characters are always just on the edge. The Dwarf is one such tale, using the setting of a hall of mirrors for its disturbing chain of events. The dwarf from a ramshackle fairground finds solace in the mirror maze, visiting night after night. He’s watched by a would-be tormentor, who realises that he is posing in front of a specific mirror, one that alters his proportions to a larger size. The nightly visits always satisfy the dwarf, until a mirror is mysteriously changed and things aren’t quite the same again. These tales date from 1955 and 1947 respectively, but Bradbury is still going strong. There’s a new film version of Fahrenheit 451 in production and there’s always room for a new version of my personal favourite The Martian Chronicles. But these older short stories are always worth a read. And always manage to unsettle.